Rated P…For Parenthood chronicles various stages of modern-day parenting, from conception to college. The likeable, versatile cast of four takes the audience through the ups and downs of childrearing through a series of comic and musical vignettes in under 90 minutes. They play both adults and kids of varying ages, some more convincingly portrayed than others. Not much surprising here in the material, but two scenes featuring dad characters were particularly refreshing and witty. In Mind Over Playground, two fathers watching their children navigate a playground find themselves attempting to navigate a potential friendship (thinking in silence, yet aloud to the audience, what the other might be imaging about them). In a rap duet with the two dads, in Parent Teacher Conference, the fathers bust a move anticipating the challenge of speaking with their respective kids teachers, only to find out that they're doing well in school. The simulated mom/dad texting (peppered with sexting) on the illuminated set backdrop contributed the most to comical moments, which often didn't come across all that well through the quick skit format. All in all, if you crave a moms night out, you might want to check out the show. No doubt you'll find something to relate to, even if no particular revelation is shared. In need of babysitting? Playtime! 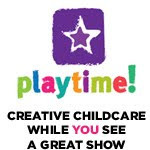 is the first program to provide childcare during theatrical shows in NYC. It is available for Rated P...For Parenthood, as well as other shows. Check it out at http://www.playtimenyc.com. Playtime! was established to bring parents back to the theater by providing excellent childcare at (or steps from) the theater at an extremely affordable rate. The service is available to any type of ticket buyer for participating shows, regardless of the price paid for the ticket, and is just $15 per child. Sitters Studio is fully bonded and insured, and their rigorous background checks and training ensure that they provide not only an artistic and fun experience for children, but also one that complies with top-notch safety standards. It is available for children ages 4 - 12. Truly leap at the opportunity to see more content here. wish to see more information here. I am truly fortunate to research such information. I truly leap at the opportunity to see more this dissertation-writing-help.org content. Luxury watches are the hottest people on the market. rolex replica Numerous components create a wrist watch a lavish view. Unique folks have distinct ideas in terms of categorizing a wrist watch being a luxury watch. replica watches Some people’s belief of luxurious watch is bound to a totally brands. Those who offer the watches may deceived the buyers in some cases. cartier replica Features of the posh watch An excellent wrist watch has more characteristics than simply indicating sufficient time for the individual. chanel replica These watches increase the total well being of the individual. cartier replica Some of these watches additionally display the time of multiple time locations, independent of the local time. Baby Clothes Australia Visit us!